Smoked salmon is a highly anticipated delicacy. With another successful fishing season behind us, I used a tried and true recipe to turn out several pounds worth. Smoked salmon mousse, smoked salmon omeletes, smoked salmon on pasta, and smoked salmon on crackers are among the many great reasons to set aside a couple of days and smoke part of your catch. Once you’ve done a batch of smoked fish, it’s easy to appreciate why it’s expensive. Smoking takes time. But the results are very much worth it. There’s really not much to our favorite recipe. From year to year and batch to batch, I might vary the amount of garlic or ginger or try a new spice or seasoning. But other than that… well, here it is. Smoked salmon pizza always draws rave reviews. The basic recipe is 4 parts water to 1 part soy sauce with 1/4 cup sea salt for every cup of soy sauce. Figure about 1 cup brine per pound of fish. Add brown sugar, garlic and ginger to taste. White pepper, cayenne pepper, and other seasonings and spices can be added to create unique brines. Pyrex clear glass bakeware with their plastic lids is perfect for marinating the fillets. If you’re using a Big Chief or Little Chief smoker, the metal racks fit atop the empty Pyrex containers – and with the fillets atop the racks this setup works well for drying the fillets in the refrigerator prior to smoking. Arrange salmon fillets in glass baking dishes or similar non-reactive containers. Smoke fish according to your smoker’s directions with alder wood, mesquite, fruit tree or hickory chips. Check frequently, keeping in mind that air temperature will influence smoking time. Typical smoking times range from 6 to 8 hours. A slightly wet product is best suited for many of the recipes we enjoy. For straight snacking, a drier product may be preferred. Don’t have a smoker? Excellent smoked fish can be made on a charcoal grill. I’ve done small batches on my little Weber Smokey Joe and larger batches on Weber’s larger models. Looking for a recipe to use your smoked salmon in? Type “smoked salmon” into the search tool on this page for some great ideas. I’m going to give this a go with our charcoal grill. I’ll let you know the results. Check the web for methods. Weber provides instructions on their site, I think. Hi Inge. We were just reading your post on Naknek. We almost took positions in Bristol Bay School District, but decided instead to come up to the Arctic. By the way, check out our recipe for gravlax (lox), too. You can make it anytime! Thank you so much! Hope you are staying warm up there! Thank you. I tried the recipe out with a few minor adjustments to what I had on hand. I was low on soy sauce so upped my salt and I used a garlic/ginger stir-fry paste. I did sneak a little molasses in there too. I used alder chips for my wood. The fish turned out awesome! Thank you for sharing! This was my first time trying to brine and smoke it myself. Usually the husband does it. Thanks letting us know! In the past, we’ve used white sugar, honey and maple syrup as well as other seasonings (including spicy ones). Glad to hear of success with molasses. Good eating! No, there is no specific temperature setting or adjustment for the Big Chief Front Loading Electric Smoker, which is the model I use. When the weather dips below 50 degrees F, wrap it in insulation, which you can buy already fitted to the Big Chief smoker. I followed your recipe using the stated amount of kosher salt and followed all the brine suggestions. I used a gas grill and use the hot side without grate to place applewood wrapped in foil atop screens over the flames set at lowest temp. Fish fillets on the cold side. My smoking time was around 2 hours with temps between 160 and 200 degrees towards the end. This was the best salmon I smoked in years without an actual smoker. Not too dry or to moist. I’ll try it with trout next. Thanks for sharing. Hank, thanks for taking the time to comment and provide information. Much appreciated, and glad your fish came out good. We use this recipe with trout, and when I lived in Oregon, we used it with sturgeon as well. can this be frozen? and how long will this keep in the frig? The smoked fish will keep in the fridge for at least one week. If you vacuum pack it and store it in a manual defrost freezer, it will be good at least a year later. In an automatic defrost freezer, I’m guessing about three months. I am leaving in 2 weeks to take our annual trip to New York salmon fishing and we usually bring back 800 to 1000lbs of fillets and I am going to try your recipe. Good luck, and enjoy the fine dining afterwards! Good look with your project, Rick. I’ve used both wine and sake in this recipe in the past. Good choice! Tried your receipt today and must say it produce some of the best smoked salmon we’ve had in a long time. And over the years we’ve had a good amount. Thanks!! We usually pick up a few Pacific cod each summer. Not Sable Fish, but we’ll take your suggestion and try a couple on the smoker. Thanks. For the Black Cod, I coat with paprika just before smoking. For the Pacific Cod, after smoking, I like to poach it in whole milk and eat warm, cold or use it as a base for a smokey chowder. Just finished smoking fresh lake sturgeon with your brine recipe. It turned out awesome! Glad you enjoyed the recipe, Doug. Lake sturgeon! Lucky! I used to get a white sturgeon from the Columbia River each year. Amazing table fish. 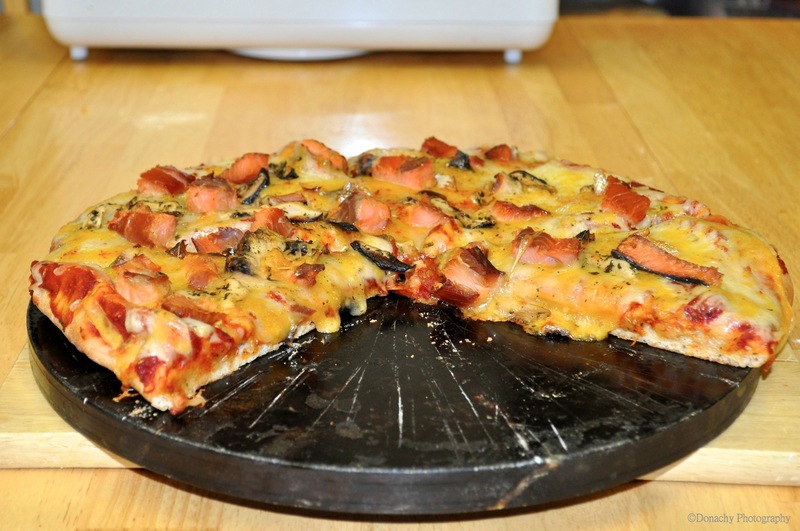 Can you please give your recipe for the smoked salmon pizza shown in the picture? Thanks for reading, Marcia. A good combination for smoked salmon starts with your favorite tomato based sauce topped with a blend of mozzerella cheese and mild cheddar cheese. In olive oil, sauté some sliced shitake mushrooms and thinly sliced garlic – tossing in a fistful of pine nuts toward the end if you have them on hand. Arrange the sautéed mushrooms and garlic onto of the cheese, then add the chunks of smoked salmon. We bake our pizzas on a pizza stone at 400 degrees F. for about 10 minutes. We often garnish our smoked salmon pizzas with strips of nori – dried seaweed. For a specific recipe for salmon pizza, see our post https://cutterlight.com/2012/01/17/alaska-silver-salmon-pizza/ or just type the word “pizza” in the search bar on any CutterLight article. Happy dining! Thanks for the recipe!! I made this in the spring and as others have stated – it’s the best I’ve eaten. And as I type, I have two more salmon in the brine waiting to go on my pellet smoker tomorrow. I used pecan pellets earlier and I’ll use the same this time. Only addition I did was a little black pepper and some cayenne pepper as well as I like a bit of a kick to it. This is a keeper for sure. Happy to hear it Randy. One of the things we like about this recipe is that it is so easy to modify with a kick of heat or more sweetness. I’ve made smoked salmon many times using different brines and yours is hands down the best ever. Thank you very much for sharing! Glad to hear it, Jim! Happy eating and fishing! Thanks for the feedback, Cassie. Excited to try this recipe. Wondering about the last comment about salt. Any reason why I couldn’t cut salt out all together and really on soy sauce for sodium, or would it not be enough? Thanks! Beaverton Oregon? I lived there for a short while before moving to Astoria – where I stayed for seven years. 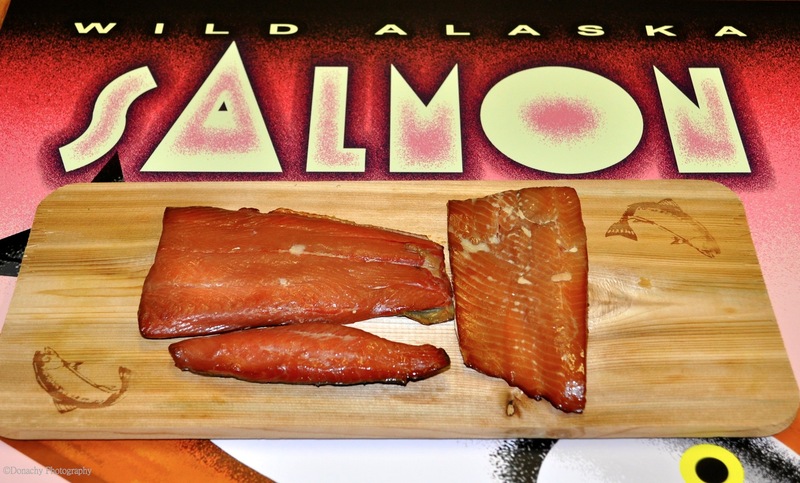 Are you smoking salmon, sturgeon or trout? Salt. Individual tastes vary. This recipe flies off the plate at parties. We’ve posted this recipe twice, and in the 30 or so comments from readers this was the first time we’d received feedback about the amount of salt. But we value input from everyone. 2) Use a little more soy sauce and a little less water. This results in a richer soy sauce flavor. I have smoked salmon many times and this is the best recipe I have used. Very similar to my families but I think the Ginger makes the difference. Very yummy! I use this on Salmon and Trout both but the salmon tastes so much better just due to the type of fish. Thanks again! Supper good! Sure, Liz but glass or plastic are better – and better for the environment. Good luck with the smoking! Can I use regular salt rather than the other? Good luck, Liz. Happy smoking! Whenever I brine, I wash off the brine before letting the pellicle form. I did not see that step in your recipe. Do you rinse off the fish after brining? Also, is the 8 hours-overnight in the fridge meant to allow the pellicle to form? Thanks! Im going to try this next weekend! Thanks for note, Bob. The Yoshida’s would be a nice twist. In the past, I have used 1 gal. water to 1 1/2 cups salt and about 1 cup brown sugar. Just brining for 2 hours, the salmon always comes out too salty. I’ve been told to soak it for less time. Is the above recipe very salty? I see here you advise smoking it for 6 to 8 hours. Thank you very much. Great ideas! Only did one filet of fresh sockeye salmon so I downsized the marinade but added a cup of Sherry. Also added chicken legs using same marinade. A huge success for adults and kids. We smoked it an electric smoker. Thanks for guiding us to a wonderful meal. We have used this recipe many times and hands down its the best! In fact we have some copper river salmon marinading right now in this brine…Big block party tomorrow. Cannot wait to taste how good it will be!!! Thanks so much for the recipe! Thanks for the feedback, Carl. Salts very in entensity, so as you continue to smoke you’ll want to pick one you like and stick with it so you become familiar with how much of it to use. The less fish you use – and the thinner the fillets – the less time they should spend in the brine. It’s important to add enough water to the soy sauce, salt and other seasonings you might use, and to mellow it with sugar or maple syrup… and with any recipe, taste the mixture you come up with before using it to make sure it’s to your liking.